The Rescuers Down Under: Can Bob Newhart Do it Again? "The Rescuers" was a surprise hit, a throwback to the days of "Lady and the Tramp" and "One Hundred and One Dalmations," when the Disney juggernaut could take an unknown story and make it into an "all Disney" movie, complete with Disney villain, Disney heroes and a warm, fuzzy conclusion. The two leads from "The Rescuers," Bob Newhart and Eva Gabor, return in "The Rescuers Down Under" (1990), directed by Hendel Butoy and Mike Gabriel, as Bernard and Miss Bianca, respectively. While it did not perform spectacularly at the box office, it has found its audience over the years and has become something of a cult classic. 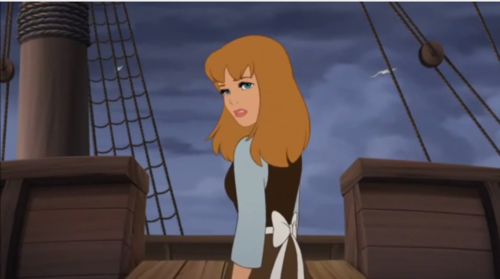 The Disney animators also went to work improving the technology, using the computerized CAPS animation process developed by then-unknown graphics company Pixar for the first time, along with CGI elements in many scenes. Whatever you make think of the overuse of CGI in the years since, it does have its place when used properly, so this was a true break-through film. Spectacular scenes such as Wilbur the albatross flying over Sydney Harbor still look good today, and, in a practice that would later become common but was still new at the time, the Disney animators visited the Australian Outback to refine their visuals. This is one of only three Disney movie sequels (the others being "Fantasia 2000" and "Winnie the Pooh") that are included within the Disney movie canon of animated features, and the very first animated sequel to any Disney movie. It also helped solidify the Disney Renaissance which had begun the year before with "The Little Mermaid" and, some would argue, continues to this day. Cody (Adam Ryen) is a young boy living "Down Under" in the Australian Outback who has a golden eagle named Marahute (Frank Welker) as a friend. Marahute trusts him enough to show him her nest and eggs, but a poacher named Percival C. McLeach (George C. Scott) wants the valuable rare bird and its offspring. McLeach sees a feather from the bird on Cody's backpack and imprisons him until he will reveal the location of the golden eagle's nest. A mouse sees this and runs off to inform the United Nations Rescue Aid Society in New York via the global animal communications network. 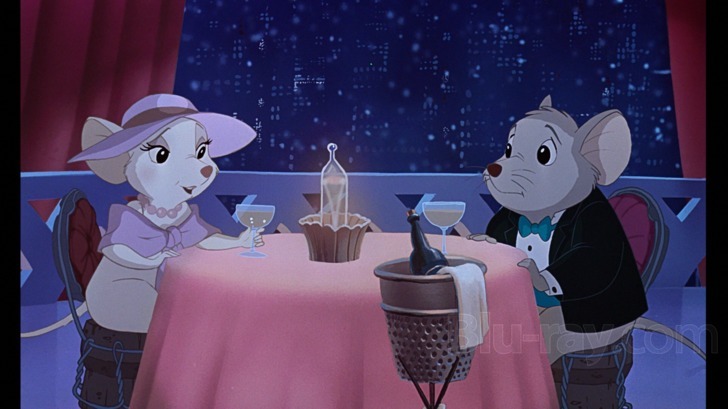 Bernard and Miss Bianca, the title rescuers from "The Rescuers," are given the mission just as Bernard is preparing to propose marriage to Miss Bianca. 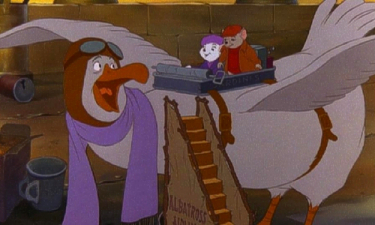 They enlist Wilbur the albatross (John Candy), the brother of Orville from "The Rescuers," to fly them Down Under to Austraila so that they can help out Cody. There, they meet friendly kangaroo mouse Jake (Tristan Rogers), who serves as their tour guide and also, much to Bernard's annoyance, hits on Miss Bianca. Wilbur has some problems with his back which are "straightened out" at the local mouse hospital. McLeach, meanwhile, tricks Cody into thinking that someone has shot Marahute, causing the boy to visit the nest with McLeach surreptitiously following. Bernard and Miss Bianca follow in McLeach's giant half-track, where they try to warn Cody, but McLeach arrives and captures the bird, Cody, Jake and Miss Bianca. 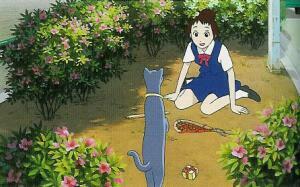 Joanna, McLeach's pet goanna (a monitor lizard voiced by Frank Welker), tries to eat the bird's eggs, but Bernard foils that plan by replacing them with simlilarly shaped rocks. 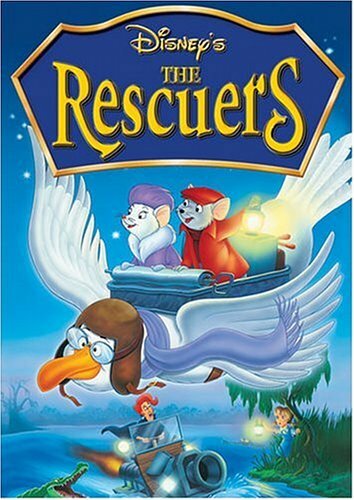 The rescuers do a lot of rescuing in this Disney movie. "I think we take one from column A and one from Column B..."
Wilbur, recovered, arrives and, at Bernard's request, sits on the eagle eggs to keep them warm so that they will be all right while Bernard searches for McLeach and the captives. They all wind up at Crocodile Falls, and McLeach intends to dangle Cody over the Fallls in order to feed him to them. Bernard, riding a razorback, gets there in time to foil the plan by disabling McLeach's vehicle. Bernard then tricks Joanna into running into McLeach, sending them both down into the crocodile-infested waters. Cody falls into the water, and Bernard tries to save him but can't. It is up to Marahute, freed by Jake and Miss Bianca, to swoop down and save both Bernard and Cody from going over a waterfall as McLeach has just done. 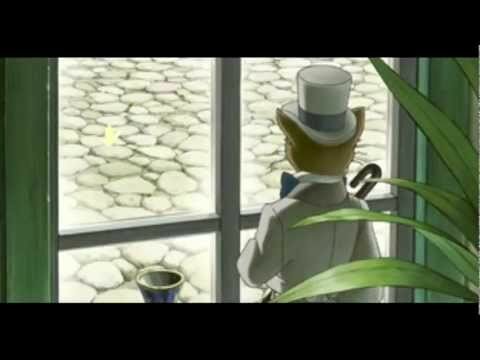 Happy at last, Bernard then returns to his original intention, proposing marriage to Miss Bianca. 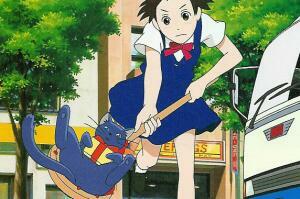 "Take that, Jeffrey Katzenberg, for ruining my film's release!" Most would agree that, despite the fact that "The Rescuers" did strikingly well at the Box Office, while "The Rescuers Down Under" did not, that this is the more enjoyable of the two animated Disney movies. 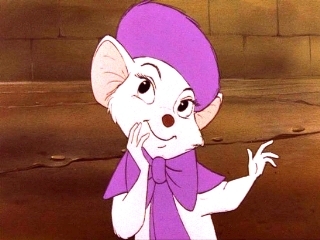 "The Rescuers" and "The Rescuers Down Under" both feature Miss Bianca, Bernard and the charlmouse (Bernard Fox) who chairs the Rescue Aid Society. "The Rescuers Down Under" has some similarities to the "Crocodile Dundee" movies, and the rescuers once again form a nice, tightly bonded team, though they don't appear until the lengthy set-up in Australia has concluded. 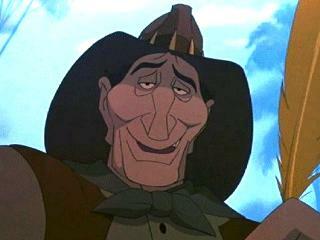 The Disney villain, McLeach, is fully realized, with a delightfully morbid sense of humor. 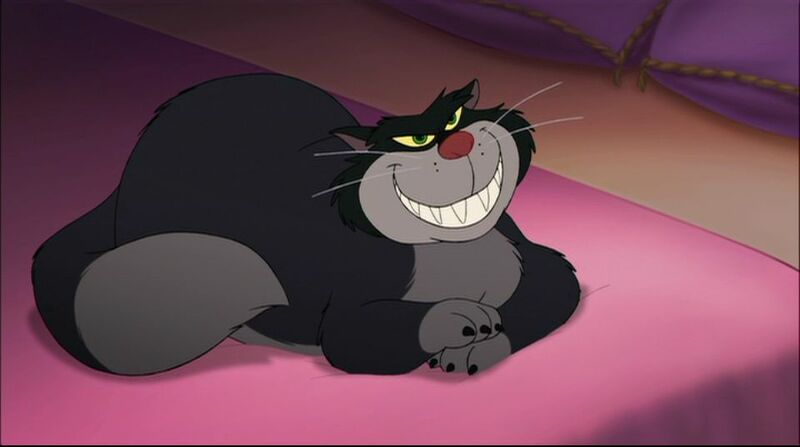 He even is somewhat believable, unlike many other Disney villains, and you will understand McLeach and the killer that he is as you cheer as he goes over the Falls. "Did they really put me on a coin? A gold coin? Cool!" 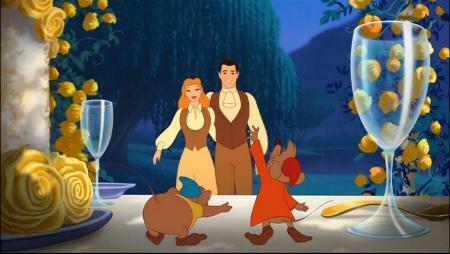 The Disney movie animation is superb. 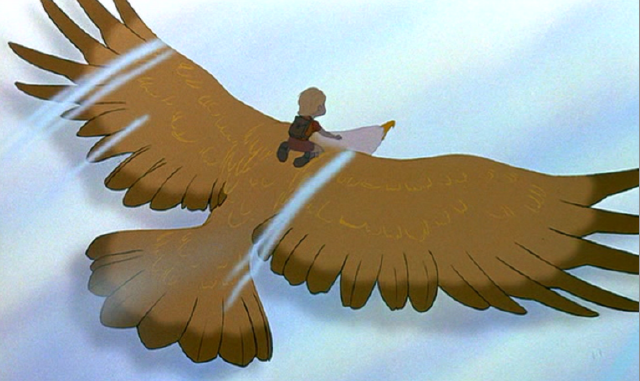 "The Rescuers Down Under" flight sequences both in New York and Down Under still amaze, and the action scenes are visually exciting. You get a view of Cody clinging to the back of a soaring eagle and dazzling overhead views of the Sydney Opera House, the harbour, and the United Nations building in New York. The visuals are so good that you might want to have some Dramamine handy. "The Rescuers Down Under" animated characters are well-developed, especially if you take the time to watch both Disney movies "The Rescuers" and "The Rescuers Down Under." 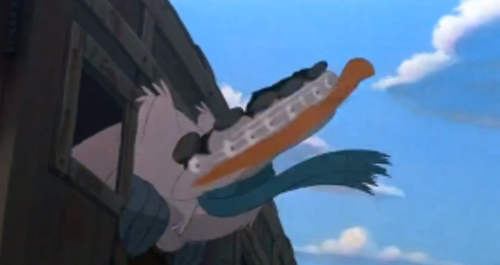 The albatross once again provides the Disney movie comic relief, and nobody could do that better than John Candy. Animators never get enough credit, so, for once, let's thank those who worked on "The Rescuers Down Under:" Mark Henn for drawing Bernard and Miss Bianca; Nik Ranieri for doing Wilbur; Russ Edmonds for Cody; Duncan Majoribanks for McLeach; and Glen Keane for animating Marahute. 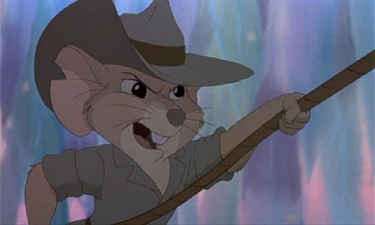 If "The Rescuers Down Under" has any problems, it may be a little too short, and some of the action scenes are a tad too intense for the youngest viewers, especially a few "The Rescuers Down Under" scenes set in the mouse hospital. 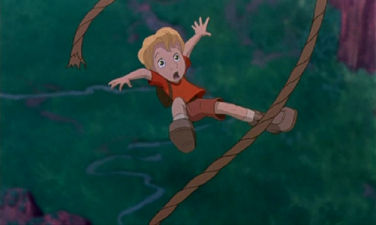 "The Rescuers" and "The Rescuers Down Under" have vastly different animation styles, with "The Rescuers Down Under" brighter and less forbidding. 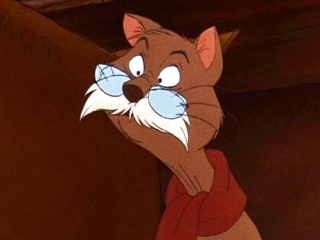 Most would probably say that the animation of "The Rescuers Down Under" is superior and breathtaking to that of "The Rescuers," though that of "The Rescuers" has its admirers, too. "The Rescuers Down Under" also doesn't have any musical numbers (though there are eccentric and humorous renditions of "Home on the Range" and "Black Slacks"), which makes "The Rescuers Down Under" a true rarity among Disney animated features - some might consider that an advantage. 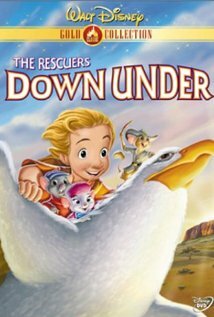 With the dramatic action/adventure plot of this Disney movie, it's difficult to see how they could have stopped the action and have "The Rescuers Down Under" characters burst into song. The most damaging thing you can say about this Disncy movie aside from debatable matters such as whether the writing by Jim Cox, Karey Kirkpatrick, Byron Simpson and Joe Ranft (based on the Margaret Sharp characters) properly uses the characters, is that it did not make a lot of money upon first release (though, like all Disney animated Features, it undoubtedly has earned the Disney team money over time with re-releases and home video sales). The story is that the film did not perform as expected over its initial weekend of release (facing stiff competition indeed from "Home Alone"), causing Disney movie boss Jeffrey Katzenberg to panic and pull all of "The Rescuers Down Under" advertising. 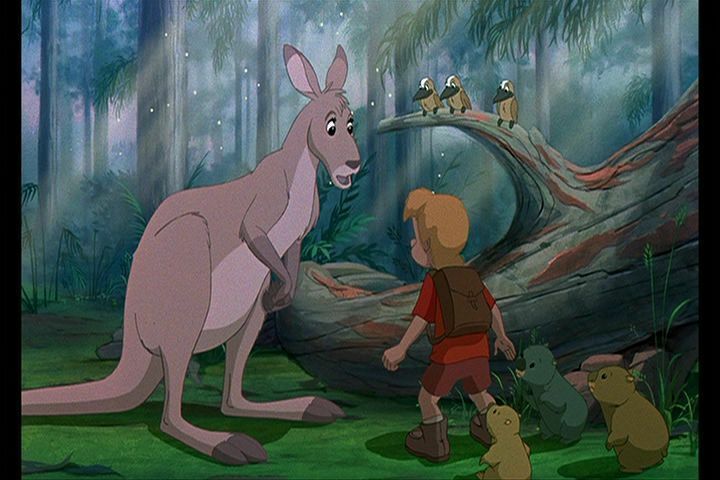 The trend of Australian-based films had bypassed "The Rescuers Down Under" by a couple of years, so what may have seemed like a good idea at the time, wasn't at the time of release. Those things, though, don't make it a bad Disney movie, just a Disney movie that had bad timing. Fortunately, Disney markets its animated films in terms of decades, not weekends, so "The Rescuers Down Under" has gone on to have a wonderful post-release life anyway. A good version to get, includes "The Rescuers" and "The Rescuers down Under"
Disney movies usually are terrific, but, in general, Disney movie sequels are so-so. "The Rescuers Down Under" is one of the best sequels among all Disney movies, with top animation and classic voice actors who had personality and style and had spent decades becoming familiar with audiences. This is a terrific Disney movie, especially if you take the time to see both "The Rescuers" and "The Rescuers Down Under" in sequence and become friends with the characters. 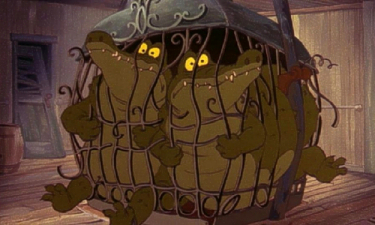 One might even call them - combined - a "lost Disney classic" and perhaps the most under-rated Disney movies ever made. The 35th Anniversary Blu ray Edition has some fun special features. Two songs, "Peoplitis" and sing-along "Someone's Waiting for You" make the cut this time. For Disney devotees who are into mice, there is the Silly Symphony short "The Three Blind Mouseketeers." An obligatory "The Making of The Rescuers Down Under" and "The Water Birds Disney True Life Adventure" allow you to spend some more time with Eva and her "dahlings." The 35th Anniversary Edition of The Rescuers and The Rescuers Down Under on Blu-ray has three discs full of material, with two unfortunately forgotten films and more than enough bonus material in one package to satisfy most fans. 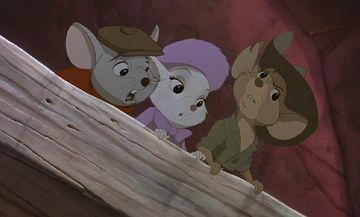 It is well worth your time to re-visit your friends from "The Rescuers" and "The Rescuers Down Under." 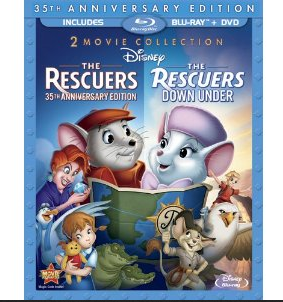 The Blu-ray "2-Movie Collection" of "The Rescuers" and "The Rescuers Down Under" came out in August 2012 and is a real visual treat, but you never know how long Disney will keep this on the shelves - it has a nasty habit of suddenly pulling titles and putting them back in the vault for a decade or two when demand starts to wane..Someday, who knows, "The Rescuers" and "The Rescuers Down Under" may get the 3D theatrical and 3D Blu-ray release that they deserve, but for now, this is a pretty spectacular presentation. "The Rescuers/The Rescuers Down Under" Blu-ray trailer is below. Walt Disney himself did some brainstorming about the idea that ultimately turned into "The Rescuers" (1977), and some of his veteran animators were still around to finish the job. Thus,"The Rescuers" legitimately can be included in the list of original Disney movies that came from Walt himself. 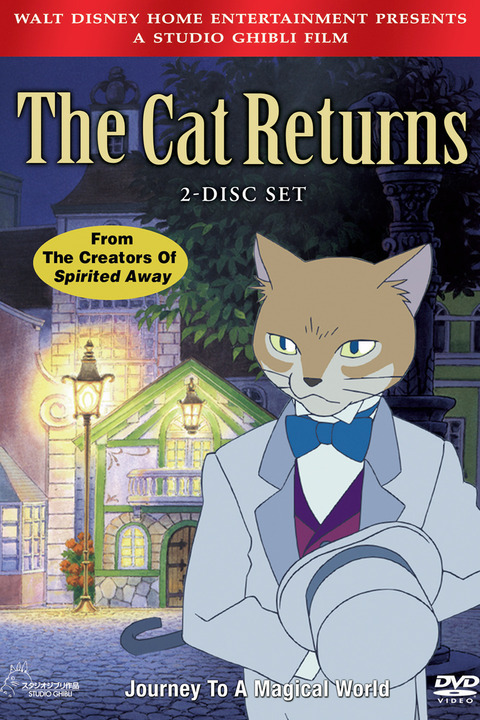 Based on a series of novels by Margaret Sharp, "The Rescuers" introduced many original concepts and performed very well at the box office. 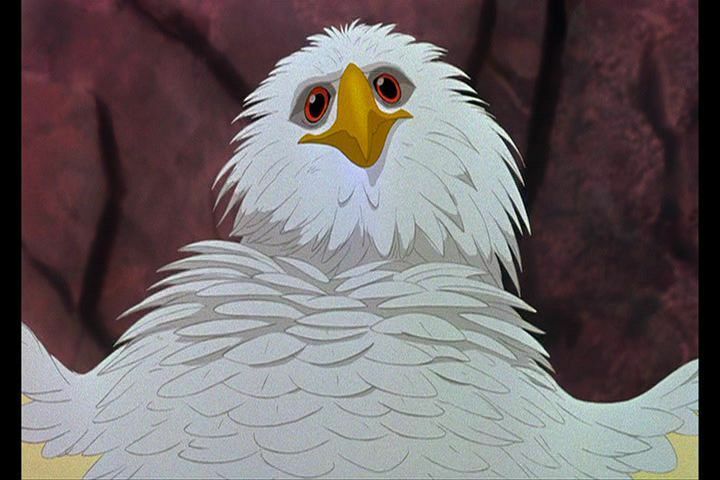 It led to a rare Disney movie sequel that itself was released as a feature film, "The Rescuers Down Under," and earned an Academy Award nomination (for the song "Someone's Waiting for You"). It was, in fact, the last Oscar nomination for Walt Disney Productions until "The Little Mermaid" came along a dozen years later and began the '90s Disney Renaissance that included the sequel to "The Rescuers." 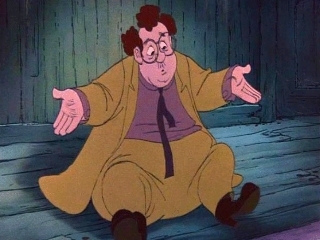 Voiced by popular comedians Bob Newhart, Joe Flynn and Disney movie regulars Pat Buttram and Eva Gabor, and directed by veteran Wolfgang Reitherman along with John Lounsbery and Art Stevens, "The Rescuers" is a fine addition to your Disney movie collection. A mouse organization within the United Nations in New York, the Rescue Aid Society, receives a note from an orphan, Penny (Michelle Stacy), pleading for her rescue. Hungarian mouse Miss Bianca (Eva Gabor) accepts the case and appoints janitor Bernard (Bob Newhart) to help her. They do some investigating and locate an old cat nearby named Rufus (John McIntire) who knew Penny. Rufus tells them about pawn shop owner Madame Medusa (Geraldine Page), who previously threatened to abduct Penny. 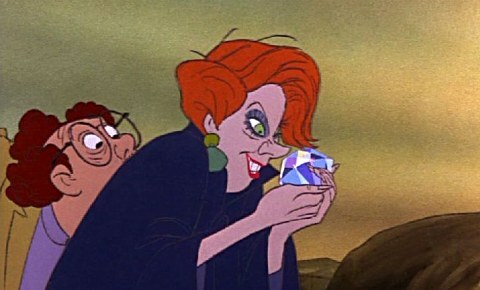 Madame Medusa and her partner, Mr. Snoops (Joe Flynn), are nowhere to be found because they left to try and find Devil's Eye, the world's largest diamond. Apparently, the two mice learn, Mr. Snoops indeed kidnapped Penny and took her to Devil's Bayou in order to try to find the diamond. Miss Bianca and Bernard enlist the aid of Orville the Albatross (Jim Jordan) and Evinrude the dragonfly (James MacDonald) to get them to Devil's Bayou. Medusa and Mr. Snoops kidnapped Penny to force her to go down a pirate's hole in order to retrieve the diamond. After evading Medusa's pet alligators Brutus and Nero, Miss Bianca and Bernard find Penny, and they devise a plan to set her free. Before they can set the plan in motion, though, Medusa and Snoops send Penny down into the cave to get the diamond, with Miss Bianca and Bernard hiding in her pockets. They find the Devil's Eye, but when they try to take it, the cave suddenly floods. They grab the diamond and barely make it out, and Medusa then takes the diamond for herself, cutting Snoops out completely. A terrific fight over the diamond then ensues, and after some trickery, Miss Bianca and Bernard manage to imprison Medusa and Snoops. The two mice and Penny then try to leave on a swamp boat, but Medusa breaks free and pursues them. A race ensues to see whether the two mice and Penny can make it out of the swamp before Medusa manages to catch them and recover the diamond. "Now we've gotten ourselves into a fine kettle of fish!" Anyone who follows comedy knows that Bob Newhart was - and remains to the day of this writing - the master of the verbal tic and the frightened demeanor and slow-burn frustration with the crassest ineptitude by others in the simplest things. Here, he has plenty of material with which to work and chews the scenery with gusto. His Bernard is afraid of flying, afraid of the number 13, and overall just a major pain to all those around him. Newhart himself was flying high at the time of this film, in the midst of his classic '70s television series, and he makes this film hum. He gets ample support from master comedian Joe Flynn (who unfortunately passed away during production) as the clumsy but non-malevolent Snoops. Other stalwarts of Disney animation voice roles such as Pat Buttram, John Fiedler and George Lindsey round out the cast. The animation team included many of Walt Disney's old hand for the last time, and also newcomer Don Bluth (who left after this film to create masterpieces such as "The Land Before Time" and "The Secret of NIMH." A real changing of the guard was in the offing, but the veterans from the 1930s were able to crank out one last hit before they handed off their duties to the new generation. They were fussy old men by then, refusing to let anyone interfere with their drawings, but their rabid self-protectiveness paid off in the end. Medusa is just lovely, isn't she? Computer graphics were still far in the future, but advancements in the xerographic animation process drastically reduced the black outlines that had plagued Disney animation since "One Hundred and One Dalmations." There might have been another connection with that film, as an early idea was to resurrect Cruella de Vil as the villainess, but that idea was given up. Instead, veteran animator Milt Kahl based the drawing of Medusa on his ex-wife. 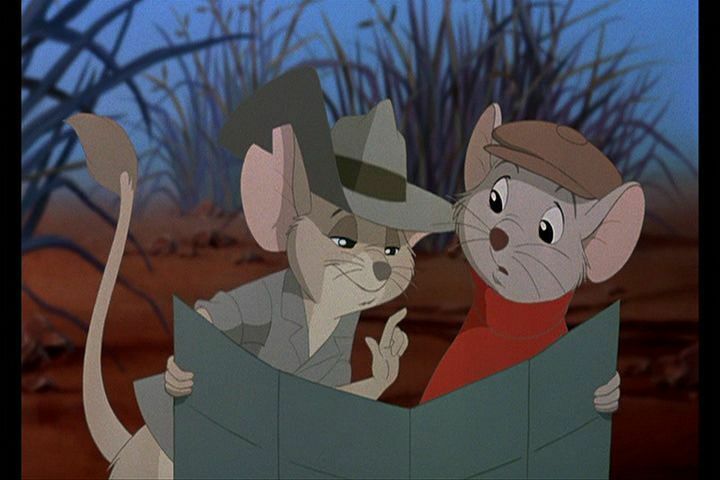 The film was a huge financial success, the first without Walt Disney's direct guidance, and earned the honor of serving as the inspiration for the first sequel of any Disney animated feature, "The Rescuers Down Under." There is a lot of humor, and not just from Newhart, as Orville is a center of comic relief. There are some scenes that might frighten small children, such as alligators snapping at Medusa, but nothing as dark as, say, what we all know happened in "Bambi." 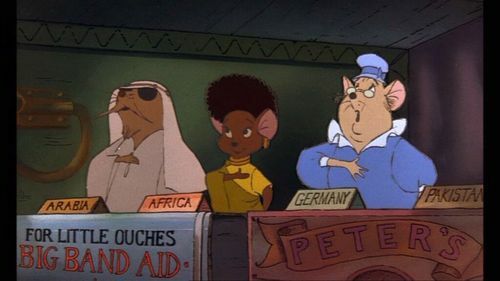 The music of "The Rescuers" is a high point of this Disney movie, supporting the narrative and earning an Academy Award nomination for "Someone's Waiting for You" by Sammy Fain, Carol Connors and Ayn Robbins (sung by Shelby Flint). The music in "The Rescuers," heavy on the synthesizers, does have a certain '70s vibe to it which either will be off-putting, or have you subconsciously dreaming of bell bottoms and clogs. The idea of having talking mice as the heroes of "The Rescuers" must seem almost passé today, but it had never been done before in a Disney movie. 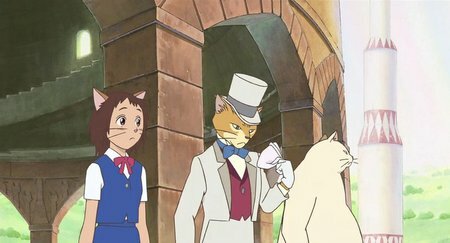 The use of mice for sympathetic characters later, of course, became almost a standard in animation films, for example in the two Cinderella sequels, "Cinderella II: Dreams Come True" and Cinderella III: A Twist in Time," and in "The Great Mouse Detective." It is easy to forget that somebody had to think up the idea and do it first, and nice to give proper credit when you can. Well, here is the origination of the idea in "The Rescuers." 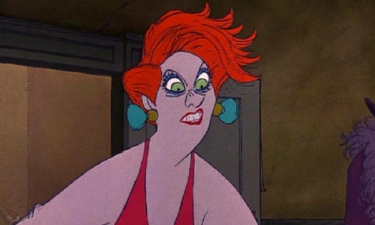 Can you tell that Medusa was modelled on an animator's ex-wife? 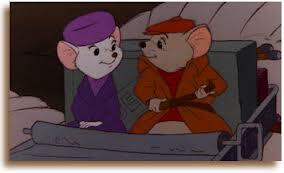 It is unfair that "The Rescuers" has been largely forgotten by a vast segment of the public. 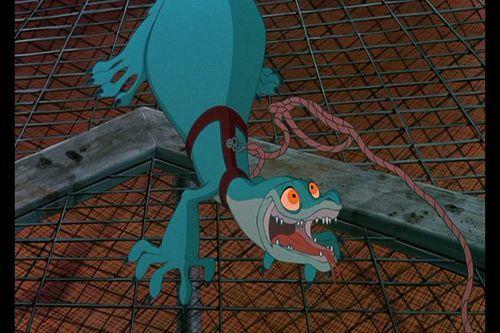 "The Rescuers" and "The Rescuers Down Under" characters are fantastic, the Rescuers songs are top-notch, and the rescuers villain, Madame Medusa, is a classic. This should be revered as highly as all other original Disney movies. 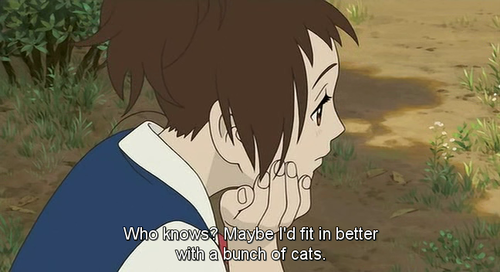 It belongs in every Disney movie collection. 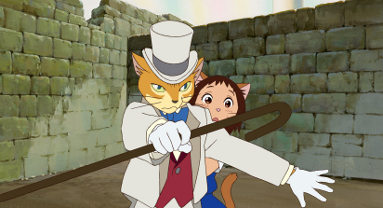 Walt would have been proud, and this Rescuers movie, released along with "The Rescuers Down Under" in a Blu-ray release in August 2012, is a high point of Disney movies and animation in general. The Rescuers trailer is below. After the creative mess (but financial bonanza) that was the fairy tale Cinderella Disney movie "Cinderella II: Dreams Come True," it was time for a different style of Cinderella Disney movie that focused on the movie Cinderella again rather than her mice pals or her (no longer so) evil step-sisters. DisneyToon Studios' "Cinderella III: A Twist in Time" (2007), directed by Frank Nissen, thus became the second Disney movie sequel to the classic fairy tale "Cinderella," and fans generally like it much better than the first Cinderella sequel and similar Disney movies. Many purists still think it reflects poorly on the 1950 Disney movie classic "Cinderella," but you can't please everyone. 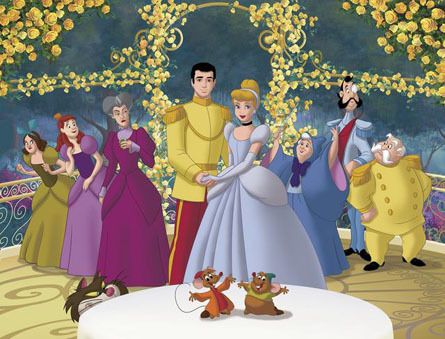 It is ten years since Prince Charming (Christopher Daniel Barnes) married Cinderella (Jennifer Hale, returning to the role from "Cinderella II: Dreams Come True"), and the happy couple celebrates with a picnic in the woods hosted by Cinderella's Fairy Godmother (Russi Taylor) and attended by Cinderella's mice friends Jaq (Tress MacNeille) and Gus (Corey Burton). Anastasia (Lesli Margherita), Cinderella's evil step-sister, stumbles upon the Fairy Godmother's wand, and after a struggle, Lady Tremaine (Susanne Blakeslee) has the wand and the Fairy Godmother has been turned to stone. 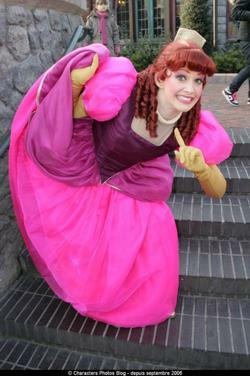 Anastasia is a fully fleshed out character in "Cinderella III"
Lady Tremaine uses the wand to turn time back to the day before the Grand Duke (Rob Paulsen) slipped the glass slipper onto Cinderella's foot. Cinderella is locked in the attic with Gus and Jaq, and Lucifer (Frank Welker) is guarding the key. Using the wand again, Lady Tremaine makes Cinderella's glass slipper fit Anastasia's foot, so she is assumed to be the one who danced with Prince Charming at the ball. Stay away from the palace, Lady Tremaine warns as she breaks Cinderella's other glass slipper, but Cinderella sneaks over there with Gus and Jaq anyway. Prince Charming can tell that Anastasia is not the true Cinderella with whom he danced, but Lady Tremaine once again uses the wand to make him believe that she is the right girl for him. Cinderella figures out that Lady Tremaine has the wand, and Cinderella disguises herself as a maid in order to steal back the wand. 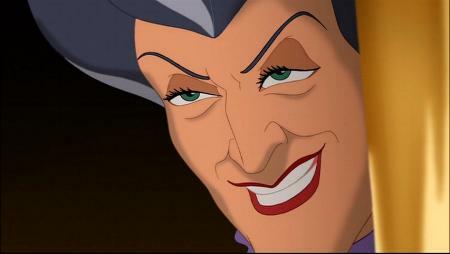 Lady Tremaine catches her, but the mice get away with the magic wand. Prince Charming is on the verge of recognizing Cinderella, but Lady Tremaine orders her shipped out of the kingdom at once. The mice then intervene and tell Prince Charming what has happened, and he stops the ship from leaving, finds Cinderella, and asks her to marry him. The King (Andre Stojka) tries to arrest Lady Tremaine, but she escapes using the wand. 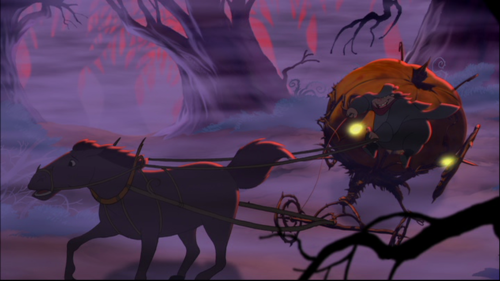 She transforms Anastasia into a carbon copy of Cinderella, then transports Cinderella and the mice into a twisted pumpkin carriage driven by Lucifer in human form. The mice and Cinderella manage to escape, leaving Lucifer in the woods. 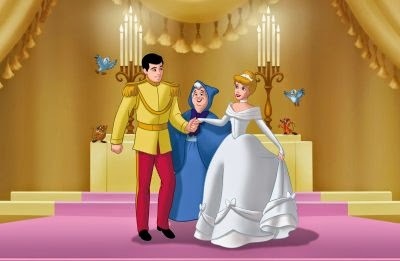 Cinderella is too late to stop the wedding, but Anastasia has second thoughts and she turns Prince Charming down. Once again the King tries to arrest Lady Tremaine and Anastasia, but Lady Tremaine waves the guards off with her magic wand. Sending a beam toward Cinderella that will destroy her, Lady Tremaine and evil step-sister Drizella (also voiced by Russi Taylor) are instead turned into toads and transported to the castle cellar when Prince Charming's sword deflects the beam. Cinderella recovers the magic wand and restores the Fairy Godmother. 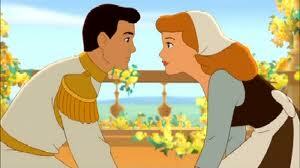 Anastasia is remorseful, but the relieved King understands that she has a good heart, so he does not punish her. 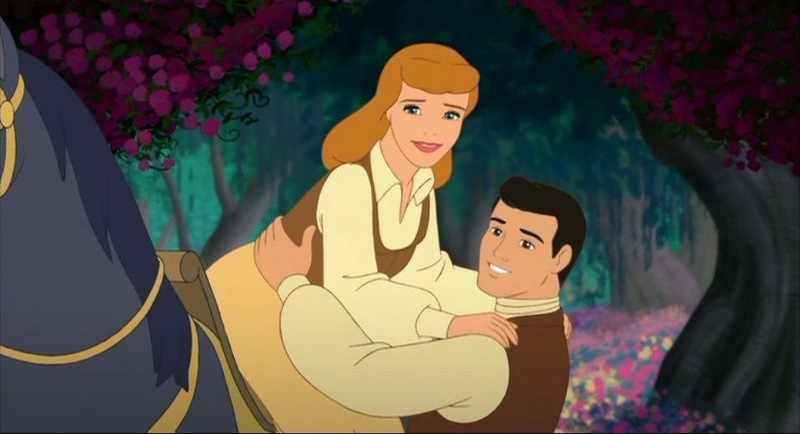 Rather than return to their own time, Prince Charming and Cinderella decide to stay in this version of reality and live out their lives in peace. Don't these two just look like they belong together? A great deal more care was taken with this Disney movie sequel than with "Cinderella II." 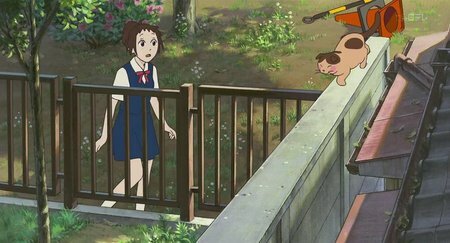 Live action sequences were filmed for aid in creating the animation, and the Disney movie animators put in a lot of time and effort, so much so that this almost has the quality of classic Disney movies like the original "Cinderella." 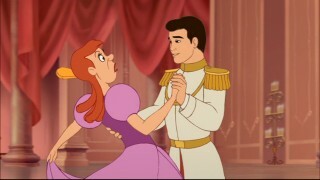 Isn't that such a sweetly sad, but real, expression by Cinderella? 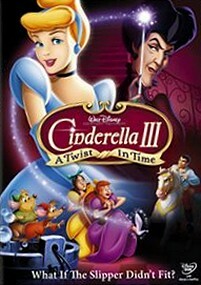 "Cinderella III" has the unique distinction of being the last Disney movie to be hand-animated until Disney made a return to that style, as the DisneyToons Studio was shut down after this production (and that studio pointedly is thanked in the credits). Senior animator Ian Harrowell managed to get his people to make a fairy tale Cinderella who is quite expressive, which helps give this Disney movie life that some other Disney movies have lacked. There is a noticeable step up in overall quality of this Disney movie from the previous Disney sequel, and the songs by Alan Zachary and Michael Weiner are worthy of a Disney movie princess production. Hayden Panettiere performed "I Still Believe" for the end credits, which was a bit unusual for a Disney movie centering around a classic character, but it works well. Jennifer Hale again does a fine job as the princess, and if you think her voice sounds familiar, it is because she also is the Queen of video game voice-overs. In fact, she's earned a spot in the Guiness Book of World Records due to all her voice roles in video games. 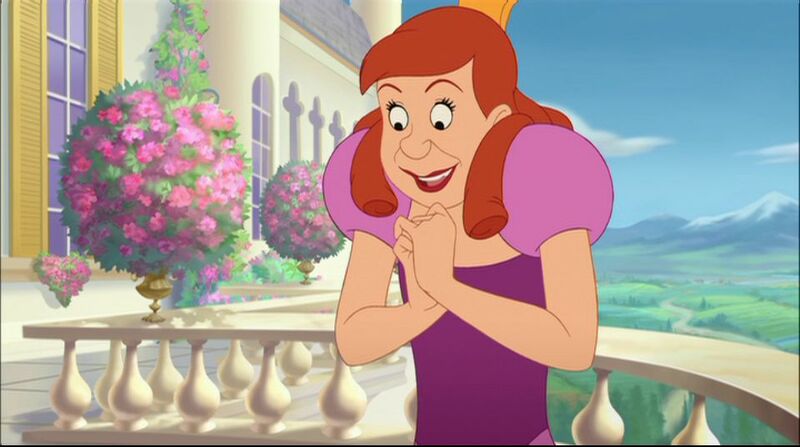 Jennifer still provides minor voices in Disney productions and is one of the most employed voice actresses in Hollywood. 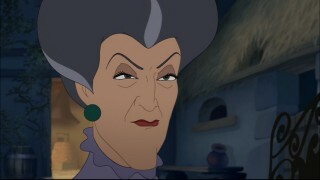 If Lady Tremaine is happy, that's not good! This Disney movie story line has a lot in common with the subsequent DreamWorks hit "Shrek Forever After," and also with a musical that runs on the Disney Cruise Line. That just goes to show how creativity can be lacking in Hollywood, even in Disney and DreamWorks movies, when film-makers don't have centuries-old fairy tale story lines to use. Much easier to play it safe with a proven product. 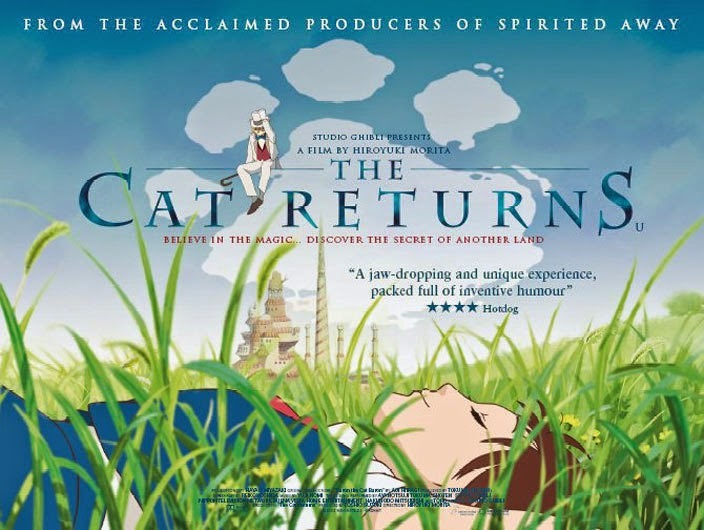 However, there still is a lot to like about this film, especially if you haven't seen those other productions. 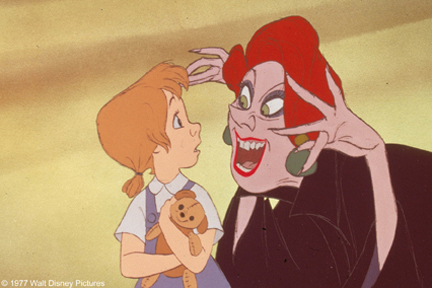 While the motivations of some of these Disney movie characters is questionable, there is no question that evil step-mother gets her moments in this film and a well-deserved fate. There is nothing like a good Disney movie villainess who gets her come-uppance, and the outlandish lengths to which Lady Tremaine goes in order to secure the throne for her daughter makes for an amusing tale of misplaced perseverance. The Disney movie characters become much more human in this sequel. Prince Charming gets a chance to fight for his true lady love, and the king has an opportunity to reflect on his own lost love. Fairy tale Cinderella can no longer rely on magic to achieve her ends, but must fight against it, proving her mettle.If you like mice as heroes, try "The Rescuers" as well. If you aren't a big fan of Disney movies Cinderella or sequels to classics in general, you probably aren't going to be interested in this Disney movie, either. However, this particular Disney movie about the classic heroine Cinderella does give more depth to the classic Disney movie characters in ways that changes and enhances them from the original Disney movie without disturbing their essences. 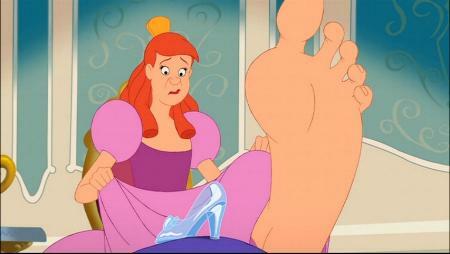 This is a worthy sequel to "Cinderella," and some would say that, in some ways, it is superior. Now, that is heretical to say, but this Disney movie is a lot of fun and opens things up for people who don't just want the classic Disney movie story about fairy tale Cinderella, but instead want something a little extra. "Cinderella III: A Twist in Time" does not degrade or lessen the Disney movie characters in any way, but treats them with proper reverence while giving them new life and dimensions. It delivers many heartwarming lessons in an entertaining fashion that get your rooting for and against the classic Disney movie characters, with a delicious "just desserts" for Lady Tremaine and Drizella. If you enjoy the characters from the original fairy tale "Cinderella," this Disney movie may well become your guilty pleasure.